LNR Warner Center is an area in Woodland Hills, California that houses many professional businesses. There are four five-story buildings and one three-story buildings so you can imagine how much signage is on the property. We have worked with many businesses at the LNR Warner Center. Aside from the quality of our products, we are the first choice because we’re familiar with the existing signs on the property. When a new tenant moves in or if all or part of a sign needs to be replaced, we know exactly what needs to be done to make sure that all of the signs match. The lobby has a metallic directory sign with clear strips to display the different tenants and their suite number. 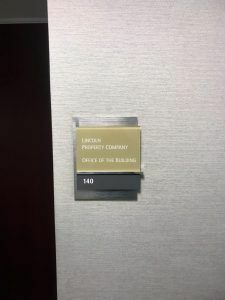 We made the vinyl lettering for Lincoln Property Company and their suite number and applied it to the existing clear strip. This vinyl lettering was reverse plotted and applied to the back of the strip to avoid wear from anyone touching it. All throughout the building, there are matching ID signs on the outside of the doors. The top layer is actually magnetic so the information can be switched out easily. 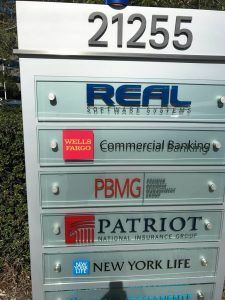 We simply replaced the top section with the name of the company and installed it on the existing aluminum panel. Like the directory sign indoors that helps people find specific businesses, outside there is a multi-tenant monument sign that lists the tenants that occupy each building. You will see multi-tenant monument signs commonly in plazas. Most will have a stone or brick look and the tenants names are printed onto interchangeable white acrylic strips. They are also commonly internally illuminated. 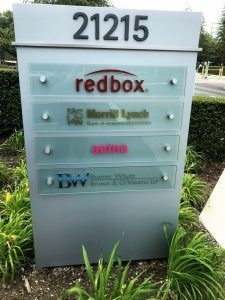 LNR Warner Center has multi-tenant monument signs that have the company displayed onto clear strips and mounted with standoffs. We made a new graphic for just Wells Fargo’s logo and made the whole logo for Bremer Whyte. These are digitally printed onto opaque vinyl and cut out. 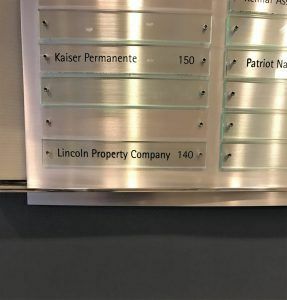 We frequently update signage for places like LNR Warner Center because on top of tenants changing, some signs simply need to be upgraded due to how long they’ve been up. While creating signage that is easy to update and replace, we also need to create signage that is long lasting and durable. The new outdoor and indoor signs blend seamlessly with the existing signs and we are happy with how they turned out.